A numerical example in Physics serves a manifold purpose. It takes the mathematical expression of a physical law out of the realm of mere abstraction, by emphasizing the connection between such a law and the phenomena of daily observation. Contents: HEAT: Temperature and its Measurement; Expansion; Transmission of Heat; Radiation and Absorption; Thermodynamics; Kinetic Theory of Gases; ELECTRICITY AND MAGNETISM: Electric Charges; Electrical Potential; Capacity and Condensers; etc. 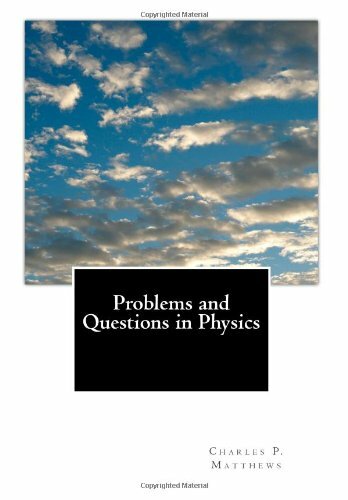 This book is a collection of homework problems for use in an introductory physics course. It is a work in progress, currently complete through mechanics and electromagnetism. There is a complete set of ancillary materials, including solutions. These notes constitute a general, non-calculus introductory physics course. Topics: Motion; Force; Work and Energy; Momentum and Collisions; Circular Motion; Solids and Fluids; Vibrations and Waves; Electric Fields and Potentials; and more.